For the past four years, De la Gente has called together the leaders of our five partner cooperatives to spend a few days together to learn from each other and to share personal and professional experiences. As part of the past four years’ Congress activities, farmers have always attended the Annual ANACAFE National Coffee Congress. This is a two day event in which farmers from across the county gather to discuss the pressing issues in the coffee industry in Guatemala. After attending last year, farmers mentioned to us that the ANACAFE Conference is repetitive year after year. The farmers said they didn’t learn anything new, and oftentimes the conference is geared to large land-owners or fincas who have the financial resources or connections to put into play a lot of recommendations or ideas presented in the conference. So, we decided on a change of plans for this year! We invited two leaders from each of our five partner cooperatives to participate in a DLG-exclusive Congress! We focused on topics and activities that will be extremely useful and applicable to our partner cooperatives and their farmer members. All participants of the Congress at Dinámica Crops’ dry mill. Farmers arrived to our guesthouse on Wednesday evening and shared dinner at Timoteo’s house. On Thursday morning, we early birds tried to get the worm, by heading out for Guatemala City at 6:00am. We hit the traffic we tried to miss but finally arrived to our destination by 9:30am. Our destination? DLG’s exporting partner, Dinámica Crops. Dinámica Crops is a family-owned business that consciously and transparently exports coffee from Guatemala for large farms and small-holder coffee farmers, and everyone in between. Two of our partner cooperatives worked with Dinámica for the 2018 harvest, and all five will for the 2019 harvest. For that reason, we thought it would be beneficial to everyone involved to visit the facility, meet the staff, and to hear about the process, paperwork, and logistics. Farmers wanted to see where their coffee would be stored, sorted, bagged, and loaded on to a truck. After tirelessly caring for their coffee plants for many years, farmers want to be sure their coffee is in good hands before it reaches its final destination. Dinámica facility manager answering farmers’ questions during the tour. Cooperative leaders asked the facility manager some tough questions about quality control and certainly made him fight to win their approval. Which he did! We all left Dinámica that afternoon feeling confident the cooperatives are trusting and willing to work with this new partner. In a country where commercial exporters have a bad reputation of stealing and swapping out one producers coffee with another, Dinámica is a refreshing change of pace. The following day, the leaders from the San Miguel Escobar Cooperative showed leaders from our partner cooperatives what our tourism program is all about. 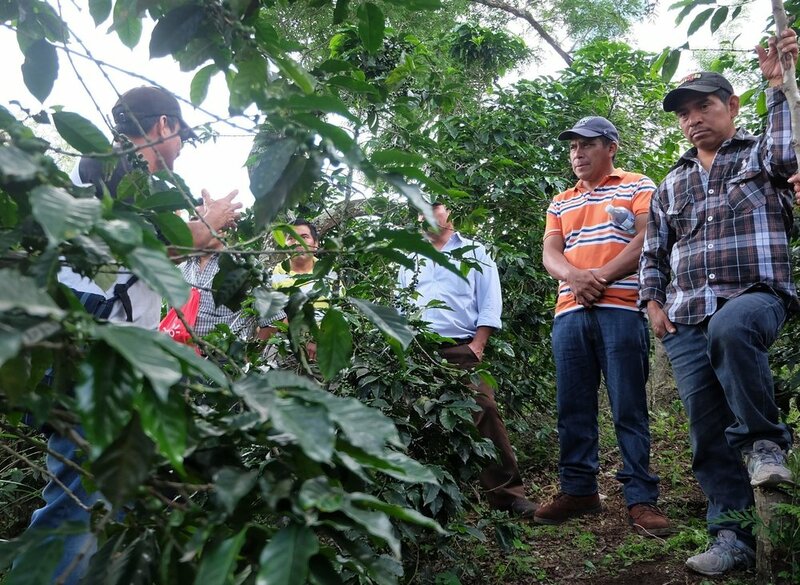 Timoteo, Froilan, and Juan Carlos took the farmers on a coffee tour! Okay, you might be thinking – don’t farmers visit their coffee fields all the time? Yes. But, they don’t practice giving the tour, reciting their experiences and stories story in coffee, and engaging tourists. Timoteo led the way, teaching leaders from other cooperatives what information to share, how to share it, and noting funny or interesting questions tourists typically ask. Coffee farmers on a coffee tour! A strenuous hike up, and a quicker hike back down, with a lot of conversation in between, farmers and staff were laughing, building a strong rapport, and enjoying their colleague’s company. We ended at Timoteo’s house, where his partner Amalia threw some green coffee on her wood burning stove and the coffee started popping. Surprisingly, farmers from other cooperatives had never seen coffee roasted on a traditional comal! They were shocked at how beautifully the coffee turned a rich amber, and then a deep chocolate. Then, they each took turns grinding the freshly roasted coffee beans on the old fashioned stone – another novelty and tradition of their own culture they had never experienced! We ended the tour with a delicious cup of coffee and a warm lunch – with farmers eager to bring these techniques to their communities. 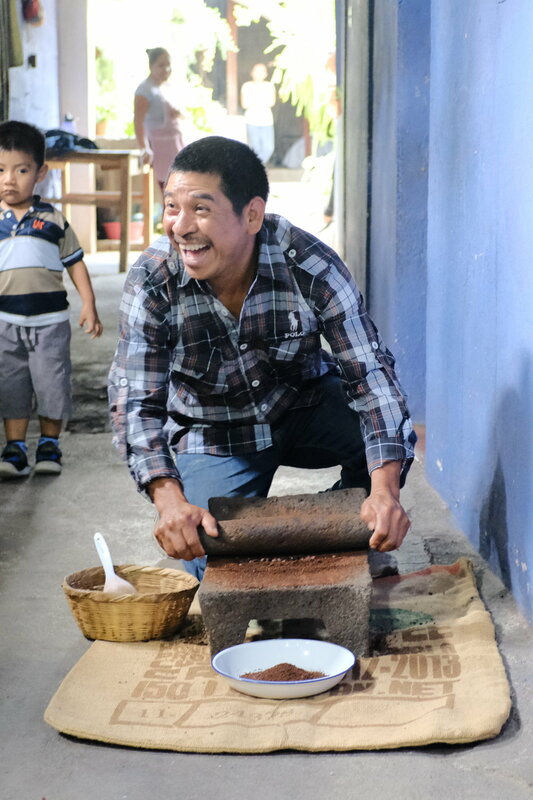 Eugenio definitely enjoyed grinding coffee on a stone! This year’s Congress was new, a little outside-of-the-box, and engaging. Leaders from our partner cooperatives who have known each other for many years, finally built a strong rapport and friendly relationship. Blandy, the president of the UPC Cooperative in Huehuetenango, and two female representatives from the Santa Anita Cooperative in Quetzaltenango got along so well they exchanged phone numbers and are eager to keep in touch! We see a stronger confianza (one of my favorite words in Spanish, meaning trusting, being a confidant and strong friend) building not only amongst the members of our partner cooperatives, but with the De la Gente staff as well. Farmers are eager to engage, learn, and build long-lasting productive, and friendly, relationships with De la Gente – showing us their coffee businesses are growing and we are eager to grow alongside of them for many more years!